Sunae Reilly is a new graduate midwife, working as a second midwife at The Lismore Birth House. Sunae is passionate about providing continuity of care to women and their families, and is working towards becoming an eligible midwife. Hospital trained and currently working in private practice, Sunae’s knowledge and experience applies to birth across all settings. She finds great joy in seeing women find their inner strength and power in pregnancy and birth, and supporting them in their transition to motherhood. Who knew that the placenta could have more than one function! Read on to see what you can do with yours. Throughout your whole pregnancy, your body grows and nourishes your child with the help of the placenta. At the time of birth, it plays an integral role in allowing your baby the time to adapt to life outside the womb by continuing to pump oxygenated blood to the baby in its first minutes of life as it learns how to breathe for itself. It’s no wonder that in many cultures around the world, the placenta is honoured and revered as the “tree of life”, as the body of the baby’s guardian angel, or as an extension of the child itself. In western cultures, however, the placenta is often treated as medical waste. If you would like to honour this incredible organ, which nourished your baby in the womb, here are six things you can do with it. 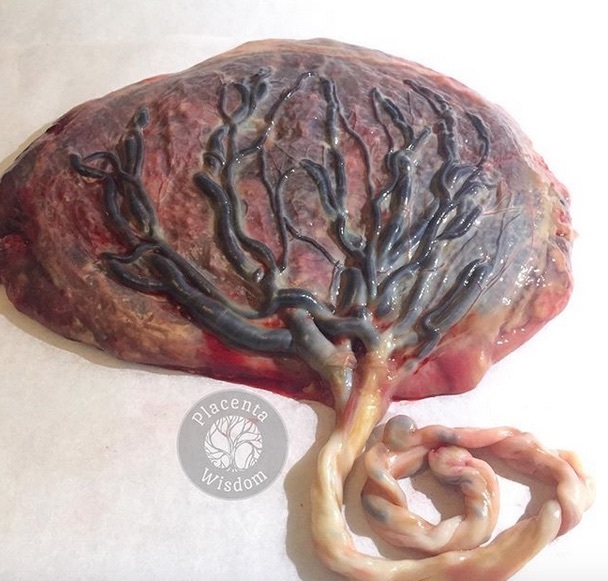 Have you ever seen the fetal side of a placenta? Dark blue vessel branch out from the umbilical cord in mimicry of the tree of life. It’s quite an awesome sight! Some women choose to honour their placenta by creating a print of it to frame as a keepsake, either using its own blood, or by washing it and applying a thin layer of paint or ink, then pressing a piece of paper to it, smoothing the paper carefully over the arranged placenta to ensure it comes in contact with the whole thing. Once it’s dry, you can roll up the paper and store it with the birth certificate and other keepsakes, or hang it on the wall in the nursery. There are reports of human placentophagy, or consuming the placenta, that date back as far as 1556, according to the 1916 Lancet. It has long been thought to stimulate milk production, and has been used in traditional Chinese medicine for thousands of years, as it is believed by the Chinese to be a powerful fortifier of ‘qi’. 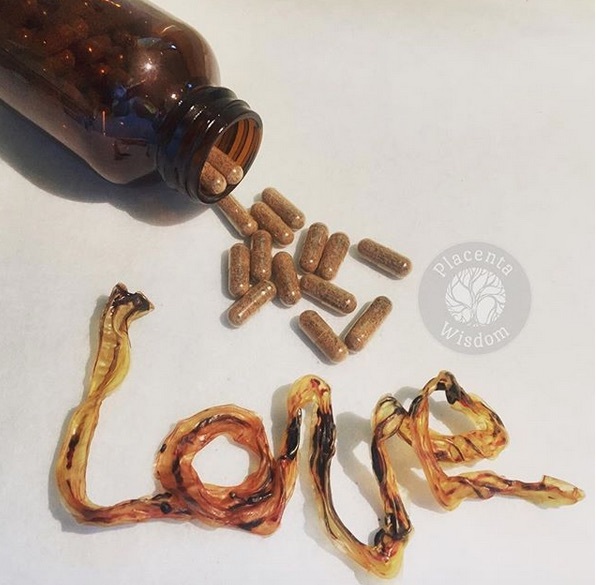 While evidence of the benefits of consuming your placenta is limited in the medical literature, the anecdotal evidence for placenta consumption, either in smoothies, meals or the more palatable option of capsules, suggests it can be beneficial at increasing your postpartum iron stores, balancing hormones, promoting lactation and preventing postnatal depression. Care must be taken, if you are planning on eating or encapsulating your placenta, to ensure that it is stored and prepared properly. The placenta must be refrigerated as soon as possible, and treated according to food sanitation protocols. If you are choosing to encapsulate your placenta, make sure the service you hire follow good sanitation practices, and have a designated preparation space that can be properly sanitised. The practice of burying the placenta is common to cultures around the world, with different traditions and beliefs surrounding the ritual. Maori people traditionally bury the placenta on tribal land to promote a personal and spiritual connection between the child and the land. The Navajo people bury the placenta to ensure the child will always return home. Cambodian people believe that a child will stay safe as long as they stay near to where their placenta was buried. In Indonesia, a family may bury a paintbrush with the placenta (to bring artistic talent), or a pen to encourage the child to be a writer, or a pinch of rice to bring prosperity to the child’s life. You may wish to explore your own culture, and any traditions surrounding the placenta or its burial, that you have in your heritage, or you may do as many western people who choose to keep their placenta do, and plant a fruit tree on it, so that the placenta continues to nourish your child as it grows. The placenta will fertilise the soil, and your child will enjoy picking the fruit off their special tree and watching it grow as they grow. Some absolutely beautiful jewellery can be made by suspending powdered placenta in resin and casting and setting it into a ring, earrings or pendant. Gold fleck, or crushed semi-precious stones can also be added to the resin cast to give your piece of jewellery some shimmer. Some Australian aboriginal peoples traditionally made a necklace out of their baby’s dried umbilical cord to offer them protection from illness, and this can be a modern way of honouring that tradition, with dried umbilical cord able to be resin cast into jewellery as well. A cord keepsake is another way of honouring the organ that gave life to your child. 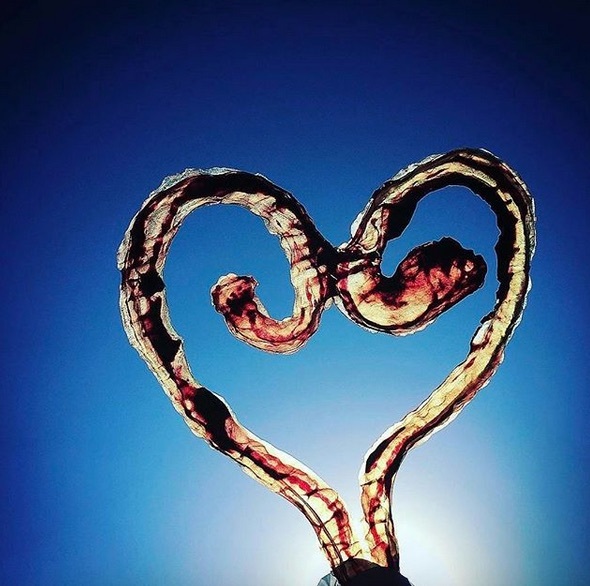 Cord keepsakes are made by arranging the cord, which is cut from the placenta, into a spiral, heart or other shape and dehydrating it in a dehydrator or in the oven on low heat over 6-10 hours. If your baby had a long cord, you might be able to arrange it into the word ‘love’, or into its initials. The keepsake will dry stiff in the shape that you have arranged it in. It can be stored in a shadowbox on the wall, or in a cool dry place. Cord keepsakes can be done alongside all of the options above. Finally, you can honour your placenta by leaving it attached to your baby, at least until the cord goes white from being drained of blood, to allow it to finish its duty of nourishing your child and assisting in its transition into the world. Delayed cord clamping allows your baby to receive all of its blood, including stem cells, boosts its iron stores in the first 6 months of life, and aids in birth of the placenta by reducing the blood volume it contains. Some people choose to have what is known as a lotus birth, wherein the placenta is left attached to the baby until it naturally detaches from the umbilicus between 3 and 10 days after the birth. The placenta is salted and dried herbs are added to preserve it, then it is wrapped in a cloth and kept in a cloth bag, with the salt and wrappings changed daily. Some people believe that lotus birth aids in a gentle transition for the baby, while others just enjoy the ‘slowing down’ effect of lotus birth, in which the space around mother and baby is held sacred, and handling of the baby by visitors is limited by baby’s attachment to the placenta – a visual reminder of its recent birth, and physical barrier to being handled by visitors, who also have to handle the placenta the baby is attached to if they want to hold it. So there you have it! Six ways you can honour your placenta after birth. Would you consider any of these options for your birth, or do you have another placenta idea or tradition you’d like to observe?